Tuesday toast the night before. I’m on board. With us getting closer and closer to finalizing our house buying/selling and moving my brain is getting increasingly fuzzy. It’s been hard for me to focus on much outside of house stuff, keeping the kids entertained, and getting some tasty food on the table. At least I hope it’s tasty. After everyone finishes a meal they seem to be smiling so I’ll take that as a good sign. I blame the fuzzy brain. The humidity has been insane here in NW Ohio and my newly grown out curly hair is taking on a life of it’s own. After 4 years of blow drying and flat ironing it every day, I needed a break. So now my routine is to get out of the shower, throw in some anti-frizz styling cream and hope for the best. The best is not great, let me tell you. But it is what it is and I’m coming to embrace it like old times. Speaking of old times, it’s been a while since I’ve put up a Tuesday Toast recipe. 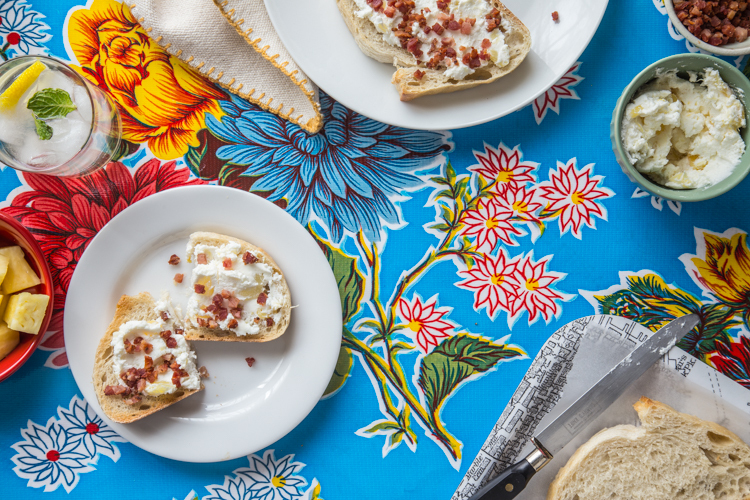 I realize it’s Monday night, but Tuesday is just around the corner and I’m not interested in waiting any longer to tell you about this awesome Pineapple Goat Cheese Toast with Pancetta. This is a toast recipe that I’ve been making for a while and photographed back in April. I think I was waiting for the perfect time to unveil my wild oil cloth background. What do you think? Pretty wild, huh? Kind of like the hair. I’m so not a selfie person, but I feel like I’ll need to share a shot of my hair sometime before the humidity dies just so we can all share a laugh. Keep an eye out on Instagram…just sayin’. Anyway, back to the toast! This pineapple goat cheese is a cheese I came across on my trip to Columbus last year with the OPA. The brand is called Turkeyfoot Creek Creamery and I’ve been able to find it at a few grocery stores around me. 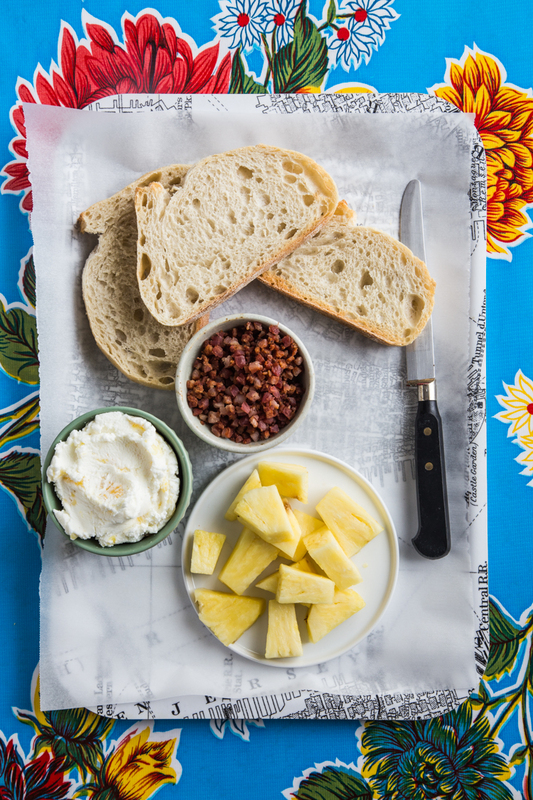 If you can’t find it, be all means mix a bit of chopped pineapple into your favorite brand of unflavored goat cheese for a similar experience. I topped the toast with some crispy pancetta bits. I was channeling a Hawaiian pizza when I started making this toast and I regret nothing. Oh, little update – my Reader Survey with $100 Amazon gift card giveaway is still going on! It’ll be live until the 18th (which is Thursday) so be sure to head over and fill out the survey and leave your email if you’d like to be entered to win. I have already gotten some super helpful feedback and am loving all of the great suggestions. Keep them coming! Thanks guys and have a great night! 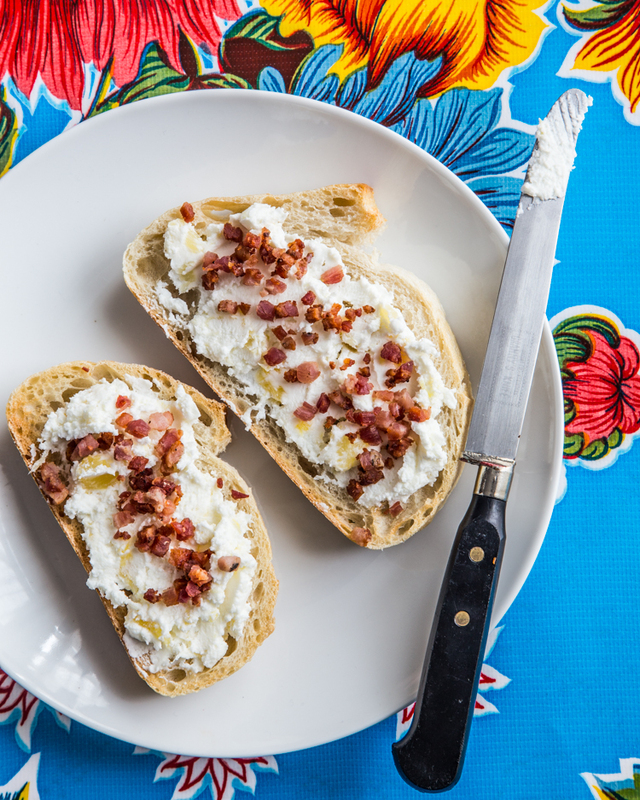 Spread toast with goat cheese and sprinkle with pancetta. Serve and enjoy! This toast looks super yum! I love goat cheese and I bet it’s perfect on this! I picture myself sitting in my screened-in porch, nibbling on one of these and sipping a prosecco. The perfect summer snack! Love recipes like this as they can go easily from snack to dinner in a snap of adding a salad. Great summer flavors, and all that is needed is a nice Rose! On a side note … I have been looking high and low for a tablecloth like yours. I even scoured Mexico (or at least San Jose) this past weekend – NO LUCK. Where did you get it? Thanks! 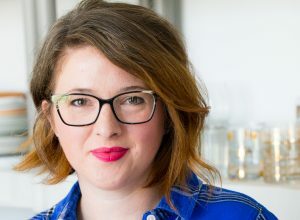 I love a good simple dinner – we eat so simply in the summertime!